As the NBA begins its 70th season, I have hopes it might also be on the cusp of a new and more enlightened era. My optimism on that score is based on attitudinal and philosophical changes I’ve seen in both the league office and among the players, who are finding their voices once again. On the league side, Adam Silver has shown himself to be a commissioner who will listen, and who will entertain points of view other than his own. And he has an understanding of and appreciation for the game of basketball. advocating for an expanded D-League and better player development. I will go into more detail on all three of these points, and also talk about how I see the new season shaping up for the teams that play the game. As the longest-serving president of the NBPA from 1965 until my retirement in 1974, the union’s newfound direction makes me proud. I am also proud of the fact that the 2016-17 season will be the 40th played under the Oscar Robertson Rule, which was enacted following a court settlement in April 1976 and led to NBA players becoming the first professional athletes to achieve free agency. I consider the Oscar Robertson Rule as important to my legacy as anything I did on the basketball court. The Oscar Robertson Rule was the result of an antitrust lawsuit I filed against the NBA in 1970 along with the 13 other player reps from the NBA teams then in existence. We sought to prevent the NBA from merging with the American Basketball Association until longstanding issues regarding player movement, the draft, and better working conditions were resolved. This was the first antitrust lawsuit filed by a players union and the first to achieve class-action status, both of which were critical to our cause from a legal standpoint. After six years of legal maneuvering — including testimony on our part before Congress to help quash an end run by the owners seeking to obtain antitrust exemption — the case was finally resolved with a legal settlement because the league did not want to go to trial. The owners believed that our demand that the reserve clause be abolished — enabling athletes to negotiate on their own behalf instead of taking whatever the owners offered them — would kill the game of basketball. But we believed that if athletes were paid at the same level as star entertainers, fan interest would grow and greater revenues would accrue to the owners as well. And that is exactly what happened. Not only do athletes in all sports make much more money today, but franchise valuations have skyrocketed. As a case in point, the two franchises I was associated with (Sacramento and Milwaukee) have opened or are building new arenas. Both are nine-figure projects financed by a combination of ownership funding and public money. The Oscar Robertson lawsuit was also a civil rights issue. Bound to their teams by the reserve clause, and actively discouraged from exercising their First Amendment rights under the Constitution, the growing contingent of black players in the 1960s NBA was nowhere nearly as vocal during the civil rights era as we would have preferred to be. Once free agency became a reality, the shackles were broken. 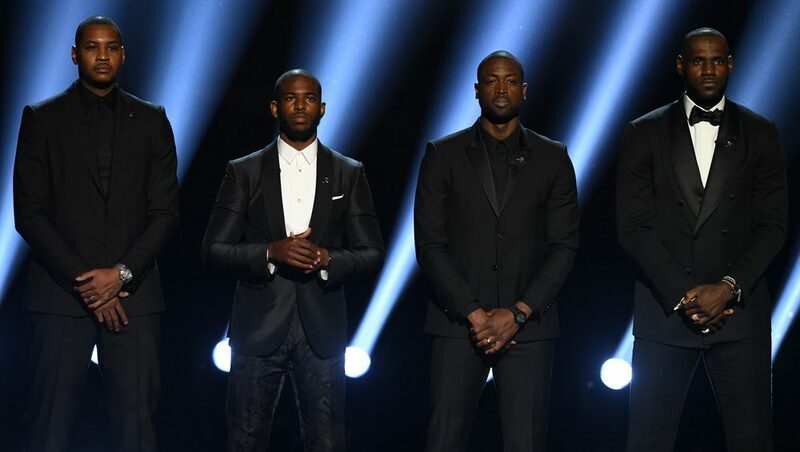 The first thing I would say to Chris Paul, LeBron James, Carmelo Anthony, Dwyane Wade, the NBA and WNBA teams who have locked arms during the national anthem, and all other athletes advocating for social change is thank you for your thoughtfulness. Your visibility is needed and appreciated. (From left to right) Carmelo Anthony, Chris Paul, Dwyane Wade and LeBron James during The ESPYS. People will tell you that you’ve made your point and now it’s time to focus on the game you’re paid to play. But why should athletes have to remain silent when there are societal issues that need to be addressed? They’re not just gladiators brought into the arena for the entertainment of the masses. Athletes are people, they have families affected by those issues, and many of them are educated and well-informed. Plus, many of them come from disadvantaged backgrounds themselves, and have firsthand knowledge of the issues they’re talking about. One of the bitter lessons we’ve learned from the first civil rights movement is that protest alone won’t bring about lasting change. Nor will legislation such as the Civil Rights Act or the Voting Rights Act. Legislation can mandate compliance, but it can’t change people’s hearts and minds. And that’s the bigger challenge in a country where, as Golden State’s David West says, a sizable portion of the population still wants to deny people of color their humanity. Practically every player already lends his name, his time and his money to one or more foundations or causes. Many of these focus on hometown issues, which are important. Then, it’s just as important to team up with as many other organizations across the country as possible to achieve critical change on a broader level. If you’re advocating for changes in police use of force, education, economic advancement, health and wellness, disproportionate incarceration of people of color, just to name several areas that we’re well aware of, then you’re on the right track. But how do you make sure your voice will continue to be heard when your first job is to play basketball and you have very little time available during the season? The same way you achieve success on the court – through teamwork. Build coalitions with other national and local advocacy organizations with similar goals. The templates for change already exist; now it’s a matter of consolidating resources. Could NBA owners be part of the solution? Right now, increased social activism on the part of the players seems to make a lot of people nervous, including the owners of the teams for which they play. But the players aren’t engaging in social activism to sabotage the owners’ revenue streams, let alone their own. They’re exercising their constitutional right to speak out, and asking others to respect their advocacy for lasting changes that should have been put in place 50 years ago. I think the time is long past when we can simply regard professional sports as a form of entertainment, part of a “bread and circuses” syndrome that offers us relief from the realities of everyday life. Taken together – owners, players, fans, media – professional sports is a huge business. Pro teams already contribute to their local economies, and they have meaningful outreach programs that benefit the entire community. So they already have the foundation in place to become a force for change. Player activism is a welcome byproduct of the players taking their union back from the agents. While the agents were running the NBPA, players were told not to make waves because everybody was starting to make some real money. In particular, the high-profile stars were discouraged from speaking out for economic reasons. If you play a game based on teamwork, sharing the ball, communicating with and supporting your teammates for the greater good, then it makes sense to apply the same principles off the court as well. Chris Paul (No. 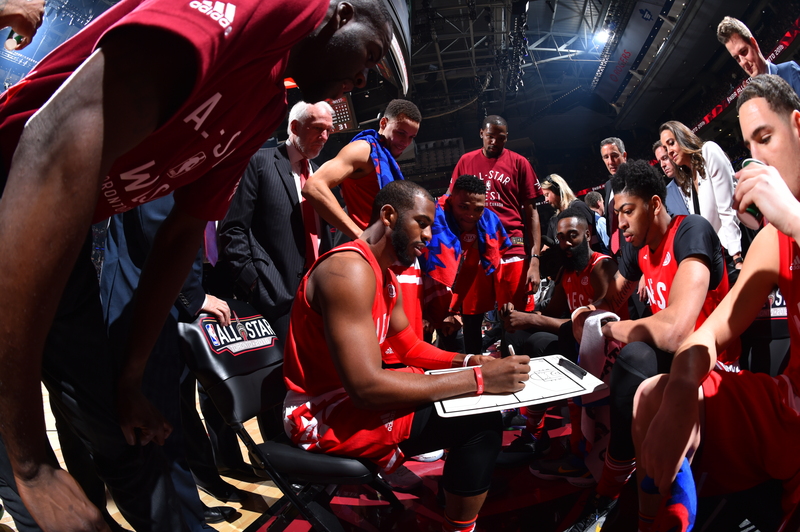 3) of the Western Conference All-Stars draws a play during a timeout during the NBA All-Star Game as part of the 2016 NBA All Star Weekend on Feb. 14 at the Air Canada Centre in Toronto. Then Anthony recently proposed a next step in sharing: Expand the Developmental League to 30 teams and make it a true minor league, with increased salaries and a mission of player development. And make D-League players members of the NBPA. An expanded D-League with an added focus on player development could help young players coming into the league develop better fundamentals and basketball intelligence so they could help their teams win. They could be better prepared mentally to deal with a much tougher level of competition. Raising the age limit for entry into the league will not accomplish nearly as much as a system that properly prepares players mentally and fundamentally for the level of excellence necessary to prosper in the NBA. Which teams can actually contend for the NBA title? The NBA seems to be at an all-time peak of popularity, fan interest, and TV revenues. Stars are popular – the fans love them, TV loves them, and we need more stars in the league. Still, I only see perhaps six or seven teams that could actually contend, another 16 that are basically plus-or-minus .500 teams, and the rest are still trying to get back on the winning track. Why aren’t there more contenders? Because you can’t build teams around 19- or 20-year-old draft picks, and there aren’t enough truly talented free agents available to make a difference. Second-tier free agents may move from one team to another, but it makes little difference in the standings. Coaching changes are not going to make that much of a difference if the coach has no players to work with. A coach can preach poise, discipline, motivation, unselfishness, teamwork, and put in a system based on all these qualities, but he still needs players who can play the game and will bond together as a team. The bigger issue is that very few organizations are successful at building and sustaining a winning franchise. This is not something that can be done overnight. And it’s not merely a matter of money, or market size. It takes the right combination of ownership, management, coaching, athletic talent, and basketball intelligence on the part of both players and coaches. Having stars, of course, helps generate more excitement and revenue. Who will still be standing next June? I look forward to the new season, and cannot wait to watch some of the matchups between the league’s premier players. But winning depends not just on talent, but on who can avoid injuries and stay healthy. That’s why depth is so critical, especially toward the end of a long season when a lot of players are tired and banged up. In the West, Golden State is even stronger, at least on paper. But it’s always a challenge to repeat. Acquiring Kevin Durant helps a lot in that respect, but they had to make some roster changes to acquire him. It remains to be seen if their bench will be as strong as before. San Antonio may contend even without Tim Duncan. They’ll miss his quiet leadership, but a Gregg Popovich team will always find a way to be competitive. Plus, they’ve picked up Pau Gasol. Oklahoma City is the big question mark. They’re minus both Durant and Serge Ibaka, but they still have one of the league’s premier players in Russell Westbrook. Let’s see how they adjust. Will the Los Angeles Clippers be stronger, with a core that’s now had another year’s experience playing together? They’ll need to avoid injuries to go deep into the playoffs, since they don’t have a very deep bench, and they’ll need to be a lot tougher mentally. In the East, Cleveland also faces the challenge of repeating. The Cavaliers played miraculous basketball to win the championship after being down 3-1 to Golden State. They still have James leading the way, and having Kevin Love and Kyrie Irving with another year’s experience playing together will help greatly. But is the bench built to go the distance? Toronto should contend. This team likewise has had another valuable year of experience playing together, and they have some A-list talent in DeMar DeRozan and Kyle Lowry. As for the rest of the teams in each conference, they may improve by a few wins here and there, but are they championship contenders? Not likely. Now, let’s toss the ball up and see what happens. Good luck to all.